What kind of car do you want to drive ? you are the driver ! Do not miss our new circuit, located at 50 km from Lyon, with its brand new racetrack. This circuit offers the possibility of driving single-seaters and GT at a very attractive price! This circuit, located at 18 km from Budapest in Hungary, is composed of continuous turns with a racetrack of nearly 4.4 km. Strong sensations guaranteed! the new F1 offers ! Our race-track driving school has more than ten years of experience in the organization of driving and initiation sessions for private individuals and business groups. LRS Formula takes its know-how wherever it is needed. Regardless of where in the world (Asia, Americas, etc.) you wish to schedule a race-car driving program, either corporate or private, LRS Formula can work with you on your project. Over our many years of experience, we have developed a network of specialists in all parts of the world. In a few words, LRS Formula accompanies you for a birthday, retirement, Christmas gift, Valentine's Day, Father's Day, or just to mark a strong moment of a lifetime... An ideal gift that has repeatedly proven! First and foremost, LRS Formula wants to be a “dream maker” and our goal has always been to give people a chance to drive genuine Formula One cars and exclusive GT models. 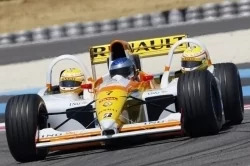 LRS Formula operates a fleet of cars that is unique in the world, with eight Formula One models (2 Prost AP04, 2 Arrows A17, A18 and A21, one Benneton B198 and one Williams FW21). The company also owns seven 7 GT cars (Ferrari F430, Ferrari F458 Italia, Lamborghini Gallardo and Porsche Cayman). The fleet, which is based at Magny-Cours, further includes two unique three-seat Formula One cars and a Formula Renault two-seater. They are the best tools you can find to share the experience of a race-car driver and to undergo a life change, as guaranteed by the offers in our catalog. Driving sessions and initiations are not just for men. Even though car racing is mainly a male sport – and exclusively so in the case of the Formula One championship – women are not barred from it. While few of them participate in race-track driving sessions, either in single-seaters or in GT cars, those who do so are highly enthusiastic. Anyone who seeks to have a racing-car experience, whether man or woman, seeks the thrills and has the desire to make their dreams a reality.